Phototherapy, also known as light therapy, is one of the most effective treatments for psoriasis. It involves exposing the skin to UV energy. It has been known for centuries that exposure to sunlight can improve many inflammatory skin disorders, including psoriasis, eczema, and vitiligo. But just what is phototherapy? How does it work? What are possible side effects? And might it be a good treatment option for you? Specifically, UVA radiation has a wavelength closest to that of visible light. UVB radiation is next on the spectrum. This type of radiation has an even shorter wavelength. It has slightly more energy than UVA radiation. Both UVA and UVB rays penetrate the atmosphere. Too much exposure to these rays can damage the skin. Specifically, UVB is the primary cause of sunburn, and both UVA and UVB play a role in skin aging and skin cancer. That’s why it’s important to use skin protective measures, like sunscreen. In psoriasis, limited exposure to UV rays can have some positive effects as well. The UV radiation has immunosuppressive and anti-inflammatory effects on cells in your skin. Because psoriasis involves excess skin inflammation, exposure to these rays may help reduce your symptoms. Scientists are still learning about all the other ways in which these rays might help treat psoriasis. Phototherapy involves exposing the affected area to special ultraviolet lights. Phototherapy is especially effective for people who have moderate or severe disease that affects a large part of their body. Of course, the simplest and oldest form of phototherapy is simple sun exposure for a brief period of time. However, for the most effective and safest results, clinicians recommend controlled forms of phototherapy. BB-UVB was the first type of phototherapy to be developed. It involves exposing the skin to wavelengths of light between 290 and 313nm. It is more effective than BB-UVB. It can be used for a variety of different skin conditions. It is easier to use than other forms of phototherapy. It has fewer side effects compared to BB-UVB or PUVA. Both types of UVB therapy can also be used after applying a layer of a topical tar. This approach, which may potentially make the treatment even more effective, is known as Goeckerman therapy. PUVA is another common form of phototherapy, the second most common after NB-UVB. It is a two part therapy. First you use a substance, called psoralen, a short time before your phototherapy session. Depending on the specific type of PUVA therapy, you either apply this to your skin or take it as a pill. Then you receive UV therapy, in the form of UVA rays. Psoralen sensitizes your skin so it will respond well to the UVA exposure. Because UVA is not as “strong” as UVB (the radiation doesn’t have as much energy), you need the extra boost from psoralen to make the therapy effective. Another newer and less commonly used form of phototherapy is laser excimer therapy. It can be considered a type of UVB-NB therapy. The laser works by targeting light therapy over a much smaller area of skin. The lasers can use higher doses of radiation, which may help the skin heal more quickly. It is currently approved by the U.S. Food and Drug Administration for mild or moderate psoriasis. It lacks the side effects of traditional biologic and systemic therapies, such as suppressing the immune system. Additionally, it appears to be safe to use during pregnancy, unlike certain other psoriasis treatments. Phototherapy is usually not used as a treatment on its own. Topical treatments (such as corticosteroid creams) are still the primary treatment for most people with psoriasis. If these topical creams aren’t effective in controlling your psoriasis, your doctor may suggest using phototherapy as an added treatment. 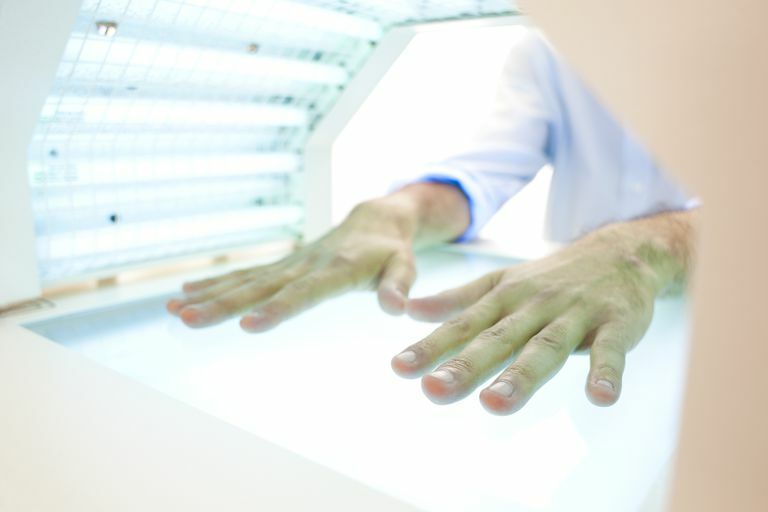 Phototherapy is typically done in a dermatologist’s office in a stand-up light box. However, with the invention of newer handheld devices, it has become easier for more people to give themselves phototherapy at home. Handheld devices also have certain advantages, because they reduce the amount of non-affected skin that is exposed to radiation. Full-body lamps and light boxes to treat the hands and feet are also available for home therapy. Typically, people receive around three to five sessions a week for several weeks in a course of treatment. After that, you might need occasional maintenance sessions or a repeated course of treatment. It usually takes at least a few sessions before your skin begins to clear up. Less commonly, people having PUVA phototherapy might experience nausea. Phototherapy also appears to somewhat increase the risk of getting skin cancer, particularly a type called squamous cell cancer. This risk is highest for people who get PUVA therapy over an extended period of time, but it is possible that UVB therapy might also increase one’s risk. Exactly how much phototherapy increases your risk isn’t completely known. You shouldn’t use sunscreen during phototherapy, since this blocks UV rays and makes the treatment ineffective. However, to be on the safe side, doctors recommend that you have regular skin screenings by a trained medical professional to check for any potentially pre-cancerous lesions. If you have concerns, don’t hesitate to discuss the topic with your health provider. People with very fair skin may also need to be cautious with phototherapy, as they may be more likely to experience irritation. Phototherapy is an ancient treatment, but one that still has therapeutic potential for many people with psoriasis. If your psoriasis is not under control with a topical medication alone, you may want to try phototherapy. Like any treatment, it comes with potential side effects. However, for many people it can provide an effective option that comes without the drawbacks of certain psoriasis medications. Menter A, Korman NJ, Elmets CA, et al. Guidelines of care for the management of psoriasis and psoriatic arthritis: Section 5. Guidelines of care for the treatment of psoriasis with phototherapy and photochemotherapy. J Am Acad Dermatol. 2010;62(1):114-35. Nakamura M, Farahnik B, Bhutani T. Recent advances in phototherapy for psoriasis. F1000Research. 2016;5:F1000 Faculty Rev-1684. doi:10.12688/f1000research.8846.1.